According to the Global Climate Risk Index 2013, developed by German Watch, the Philippines ranked first in terms of fatalities and economic losses caused by extreme weather events. As a result of climate change the number of extreme hot days (>35°C) and the number of days with heavy rainfall is projected to increase in the future, which might lead to crop failure. Climate change is also projected to increase rainfall associated with tropical storms by 20% by 2100. Within the last few years the Philippines have been hit by a number of strong typhoons. Super Typhoon Haiyan, which struck the Eastern and Western Visayas region in November 2013, affected 16.1 Million people. An estimated 450,000 fishermen and farmers lost their livelihoods. In response CARE, with German Donor Coalition funding, supported affected communities in climate-proofing their main livelihoods through the project “Strengthening resilience towards natural disasters and climate change impact”. A cartoon was created for local farmers, in the Visayas, to illustrate the cause and impacts of climate change, and to show simple adaptation measures for the main agricultural activities. The hope was that this information would support them in building livelihoods that are more resilient to projected future climate change. The cartoon pamphlet can be downloaded from the right-hand column of this page. Highly visual materials such as cartoons are useful tools for communicating climate risk and adaptation measures to communities in which literacy skill is low. The development of highly visual material for the Visayas was essential due to limited literacy rates amongst the affected communities. Written guidance would have inhibited the uptake this information. Visualised materials are valued by communities. Past experiences of the CARE team implies that highly visualised materials are also likely to be more valued by communities, especially when they are adapted to the local context, as communities are better able to identify and thus engage with the material. This appears to be the case in the Visayas, where the uptake of and response to the cartoons to date has been very positive. Following typhoon Haiyan, CARE Germany supported the reconstruction activities of affected communities in the Visayas. In order to 'build back better', the team designed a project to increase community resilience to natural disasters through the development of community enterprises, which contribute to DRR, and are pursuing climate-smart activities. In a participatory workshop with community members, the team assessed the main hazards and climate risks in the communities and their impact on their main livelihoods. The team then introduced adaptation approaches for the community's main livelihoods (based on desktop research by CARE Germany) to increase awareness of climate change and disasters, for example income diversification and improved processing of raw materials for better economic return (e.g. banana and root crop chips, Tikog handcrafts). 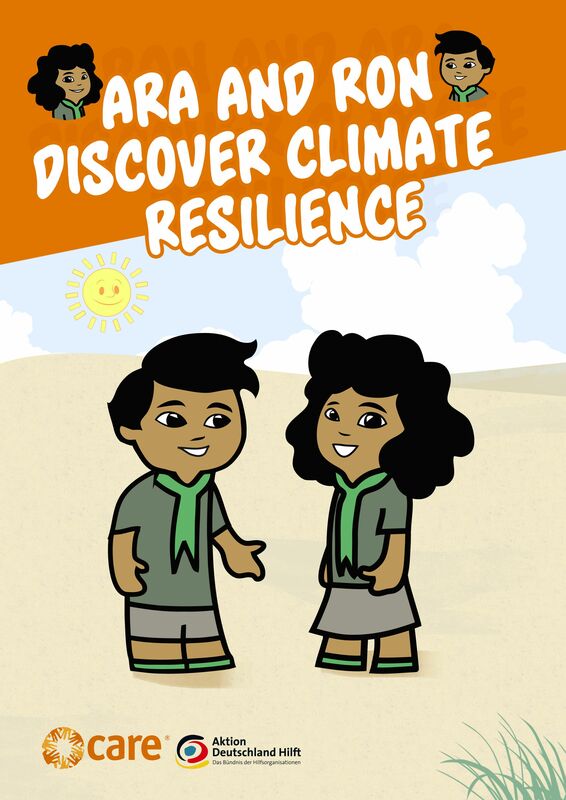 The cartoon was developed by the team in order to better communicate the main hazards and climate risks to the communities, and identify ways in which the community could take action to reduce their vulnerability. The cartoon was disseminated during a workshop on “Disaster Risk Reduction – Climate Change Adaptation and Nutrition”, which took part in January 2017 for community enterprise entrepreneurs from the Visayas. 500 copies were also printed and distributed in Eastern and Northern Samar Province. The materials are used for trainings lead by CARE in the communities and for CARE's partners and governmental officials. Promoting an understanding of the vulnerabilities and resilience of islands not only among SIDS but also among countries with islands. An analysis of 10 years of climate change research in the Caribbean found that sectors that are vital to regional economic development are vulnerable to climate change and its impacts. This analysis from CDKN identifies a series of approaches to help community-level organisations to increase climate resilience in the Caribbean. This document provides an overview of the ways in which climate and livelihoods interact in the country. A special section on El Nino impacts is also included. This cartoon was created for local farmers in the Visayas to illustrate the causes and impacts of climate change, and to communicate simple adaptation measures for local agricultural activities. New web-based resources encourage the adoption of coastal ecosystem-based adaptation (EBA) as part of wider adaptation strategies of island nations. A handbook to help local facilitators train communities to identify climate change adaptation strategies and to identify indicators of change and triggers for when to act.